Three of the October columns of “Your Town and My Town” were founded on the reminiscences of Ray Yocom of Long Branch, Calif., whose youthful days were spent in the home of his uncle and aunt, Mr. and Mrs. Oscar S. Dillin at the Old Store in Radnor. 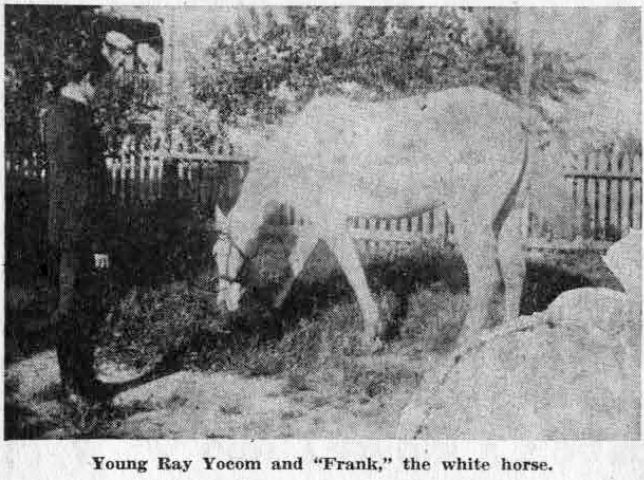 The columns were illustrated by pictures from Mr. Yocom’s scrap book, including both an exterior and interior picture of the store, as well as one of Frank, the horse, and the store’s delivery wagon. 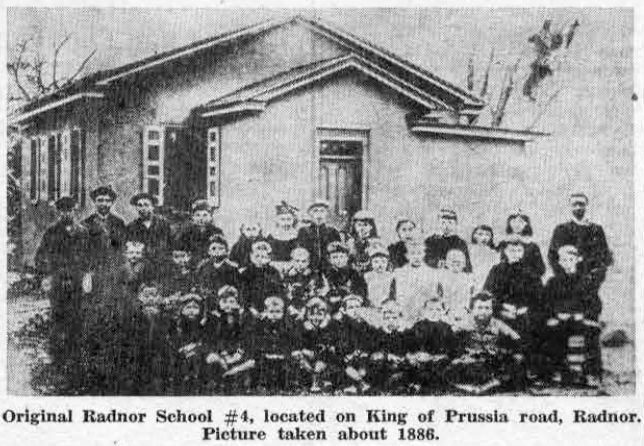 And then there was the picture of the second Radnor School No. 4 as it looked in 1896, with its pupils and teacher standing in front of it. With today’s illustration we are using the last of those scrap book pictures which we feel are of general interest. This picture might well be called “a quiet Sunday afternoon” since young Ray is so obviously dressed as he would be for Sunday school and church. “Frank,” the white horse, is enjoying his day of rest after six days between the shafts of the delivery wagon. On the back of the picture Mr. Yocom bas made a notation that he was about 15 years old when this picture was taken, and that the background shows the rear of the store and the house. 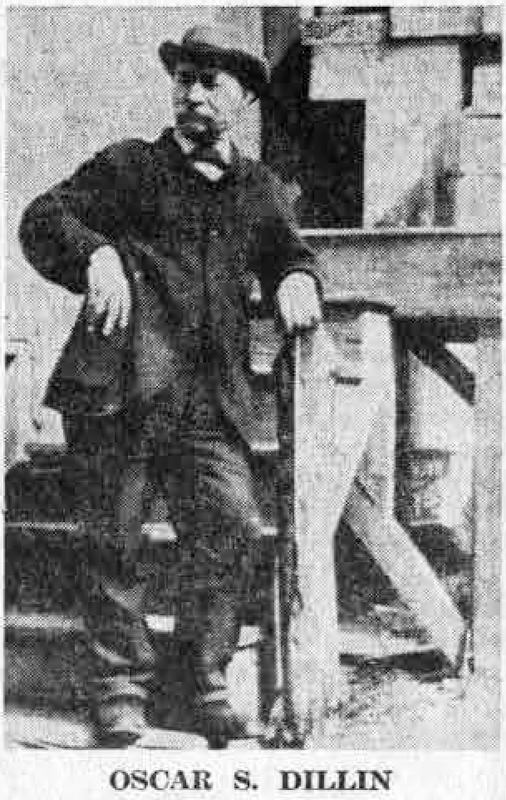 Mr. Dillin, who was proprietor for many years of the store that bore his name, died in 1915. Here he is standing on the loading platform on the side of the Old Store, facing the Lindenwood Hotel, as part of the present Radnor Inn apartments was once known. In connection with the picture of the old Radnor School, we related the pastimes of youngsters in the 1880’s and 1890’s as given in Mr. Yocom’s notes. We continue today with notes on what these youngsters did as they grew somewhat older. “We could have fox hunts. The Torpey family had a bunch of foxhounds,” Mr. Yocom writes. “When there was a real fox hunt my Uncle Oscar would close the store for the day… we would get one day a year at Atlantic City, taking the train from Camden, $1.00 round trip. We had everything with us including fried chicken… the only things we had to get there were our bathing suits. “At home we had clay pigeon shoots and live pigeon shooting matches… ‘Old Maid’ was our game of cards… quite often we could take in a good train wreck on the railroad at Radnor. It would take several days to get these wrecks cleaned up… of course in winter there was sledding and sleighing and skating on Motts Dam… we drank hard cider from cider presses and got almost woozy… we held boxing matches in the field in front of the Dillin Store… we held contests to see who could drink the most water… Dave Casey and Henry Strunkey had a raw egg eating contest… Dave ate 34 and Henry 33. Johnny Gallagher got water-logged from drinking so much water. We had to roll it out of him. Mrs. Louis Goebel, of Berwyn, telephoned your columnist that she can identify five pupils in the picture of Radnor School No. 4 in addition to those named by Mr. Yocom. These include her brother and herself, Norman and Helen Famous, also Lane Cox, Kate Quigley and Laura Noblett. One of the many fascinating angles of the work of your columnist is the unexpected help that comes along the way in collecting small bits of information which, when painstakingly put together, form stories of the past about the community in which we live. In the midst of a quiet Monday evening at home a week or two ago, the telephone rang and the operator announced it was Milford, Pa., calling! The voice at the other end of the line belonged to none other than O. Howard Wolfe, a resident of Radnor for some 65 years before he and his wife moved to Milford. While Mrs. Wolfe was cleaning out a closet that afternoon, she had found an “old and rare photograph of Radnor School No. 4, as it was about 1886,” to quote Mr. Wolfe himself, and within a day or two the picture arrived by mail, accompanied by a letter supplementing the information given your columnist over the telephone. This picture is indeed an “old and rare one,” antedating by some 10 years the one sent in by Ray Yocom, of Long Beach, Calif., for use in the October 15 issue of “Your Town and My Town.” Mr. Wolfe dated the photograph about 1886 when he wrote the following: “This letter is by way of a ‘footnote to history’ and in reference to the enclosed clipping from your interesting column of October 15. However, no contradiction need or should be printed, since I am sure very few of the students are still living who attended the little one room school house at Radnor which is (and was) the one shown on the map Paul Thomas sent you. My first year in school was spent in the little school house, which stood just in the rear of the present building back of which Ray Yocom’s photograph was made. I would say its front door was just about at the spot on which the photographer must have stood. It was torn down about 1890, when the present building was erected. Architecturally, it was like most others of the period – a corridor at the entrance, on each side of which was an open closet for the hats and coats, boys’ on one side and girls’ on the other. “In the center of the single room was a large stove. We boys sat on one side and the girls on the other, usually two children to a single desk. One of the very severe punishments was to make an unruly boy move over to sit at a desk with an older girl. Miss Ellen Buzby, our teacher, was a firm believer in the use of the rod, in this case a heavy blackboard oak ruler. According to Mr. Wolfe’s identification, the smiling-faced little boy in the exact middle of the front row is the late Colonel Robert L. Montgomery, prominent Philadelphian who lived at “Ardrossan Farms,” Ithan. On his left is Dave Casey, a retired Pennsylvania Railroad conductor when he died a few years ago. Next to him is W.W. Montgomery, Jr., well known lawyer and older brother of Robert L. Montgomery. On the latter’s Left is Jimmy Geary, who lived at what was once Upton Station, between Radnor and Villanova. Reading the other way from Bob Montgomery, in the center of the picture on the front row is Charlie Pugh, next to him the late Charlie Fellows and on his right his brother, Walter, who is a physician, living at 2048 North 63d street, in Overbrook, according to Mr. Wolfe. On the extreme left of the second row Mr. Wolfe names the late sheriff of Delaware County, Nathan P. Pechin. On his left are Jerry Casey and Hiram Pugh. Standing at the extreme left of the back row is the late Matt Wolfe, with his brother, Charlie, the second on the left. “The teacher,” Howard Wolfe writes, “if it is the teacher with the buttons on her dress (back row), I do not recognize. Ellen Buzby should have been the teacher at that time, so I guess ‘Miss Buttons’ might have been one of the seven girl scholars.” On her left is Agnes Neary, whose father operated one of the Martha Brown farms, later St. Davids Golf Club. Fourth from the right, back row, is Lily Schreiber. Our sincere thanks to Mr. Wolfe who, on closing his letter, says, “It has been a great pleasure to me to be able to give you some slight help in collecting data of Radnor long ago.” Surely no one is more qualified to do so than the lad who grew up in the Radnor of which he writes, and who later became, not only president of the Radnor Township School Board, but president of the Board of Township Commissioners as well. The Wayne House on Lancaster avenue, where Helen Kellogg now has her dining room, has always looked very much as it does today, although it was built in the early 1900’s. Mrs. Malcolm Sausser, former assistant to Charles Wood, builder of the hostelry, recalls that its register contained many interesting names, among them that of the French consul to Philadelphia and his Belgian wife. Others on the list were a Mrs. Gardiner, who was the daughter of Henry Terry Baird, a prominent Philadelphian of his day, and Bodine Wallace and his mother. Long-time residents of Wayne who lived at the hotel before buying homes of their own were Mr. and Mrs. A.I. Wood, with their daughter and son, Anne and Nelson, and Mr. and Mrs. John Turner, with their children, Velma and Warren. 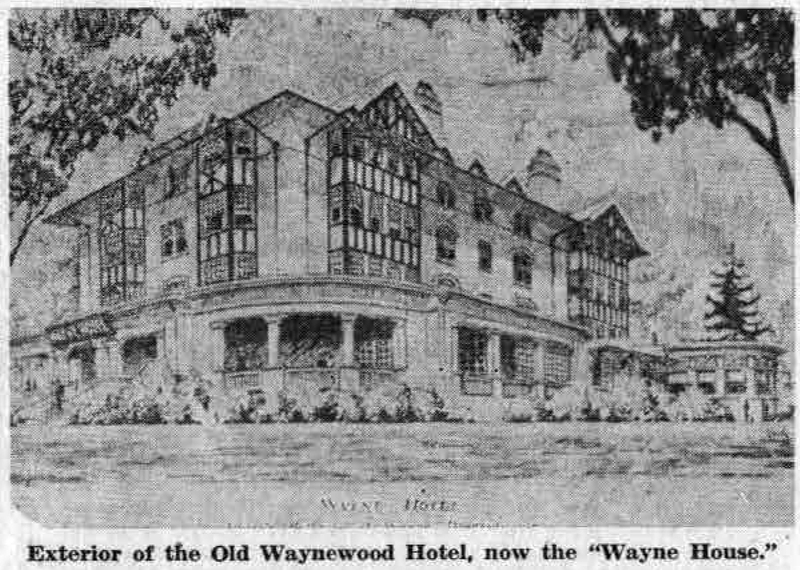 Life was lived more formally in the early days of the Waynewood Hotel than it was later, a formality which often demanded evening dress for its guests when they assembled in the great dining room with its enormous bay window to the East. This sunny addition to the room shows very plainly in the picture. The tree to the extreme right is probably the same one that blew down the night of Hurricane Hazel which preceded the opening of Miss Kellogg’s restaurant by just 24 hours. 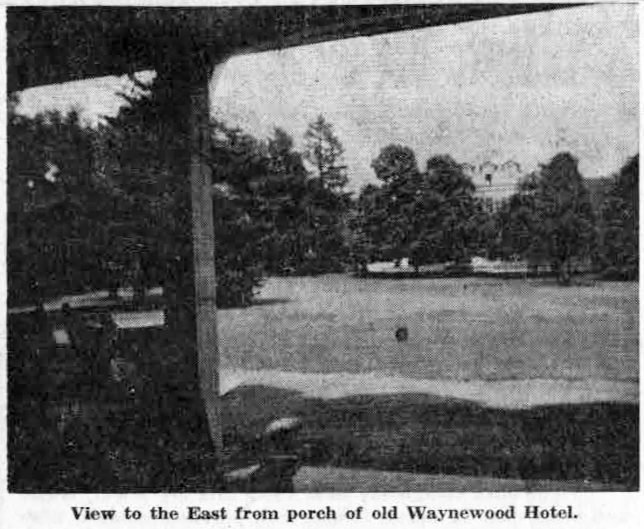 When Mr. Wood built his hotel the wide porch extended not only across the entire front of the building, but also around the east side as far as the bay window. This section was later enclosed with glass as shown in the picture, and remembering the days when guests enjoyed leisurely hours in rocking chairs on the side porch, Mrs. Sausser feels that the hotel lost some of its charm when the change was made. The picture shown above was taken by Mrs. Sausser when the porch was still open. 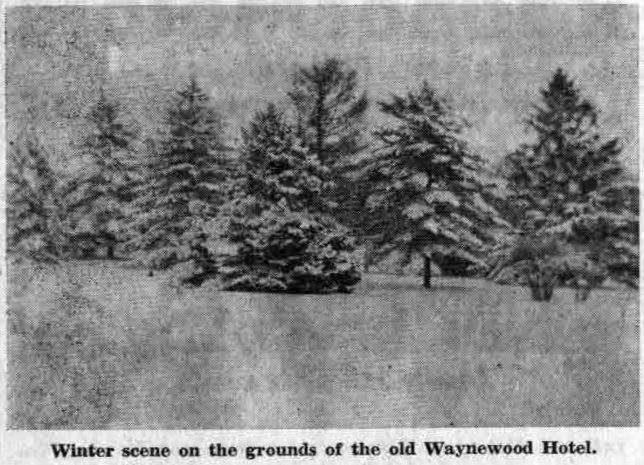 The grounds of the Waynewood adjoined those of the Louella, neighboring shops had not been built, and on Louella court and Louella drive there were only trees, many of them dating back to the days of the Indians and the following Welsh settlers. Almost in the center of the background the familiar outlines of the old Louella, originally the home of the Askin family, can be seen. This picture shows the same view as the preceding one, except that a heavy snow lay on the ground and weighted the branches of the trees. Another picture taken on the same snowy day shows St. Mary’s Church, just across the Pike. When the once great lawns of the Waynewood and Louella gave way to businesses and homes, much of the beauty of their vistas was lost. One of the largest of the old trees, which grew on the site of Halligan’s store, became in 1922 Wayne’s official Christmas tree and the first community singing, led by Edgar L. Hunt, was held under its branches. Two years ago this December its place was taken by a handsome Douglas fir, planted at the entrance to the Wayne Presbyterian Chapel by Mr. and Mrs. Mortimer Newlin in memory of their son, Frank Battles Newlin. As an interesting postscript to the story, Mrs. Sausser says that she remembers clearly the day she purchased the Brownie camera she used for the pictures. It came from Fronefield’s Drug Store, located on the corner the Sun Ray Company now occupies. Like Leinhardt’s Bakery, the shop was then approached by a flight of stone steps. Pictures of the same place, taken at periods as much as 50 years apart, are usually shown to point up the changes the years have made. But in this case it is the lack of changes rather than the presence of them that makes for interest in these two pictures. To at least one person in the well-filled dining room last Saturday, this similarity was almost startling. Malcolm G. Sausser, who took the second picture many years ago, remembers the room when the softly burning candles were used on every table each evening during the greater elegance of living of 50 years ago. 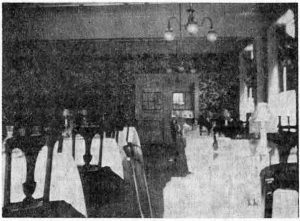 On October 16, when Miss Kellogg opened her new dining room to the public, candles were again a necessity. Twenty-four hours before, the hurricane that swept its way through the Philadelphia area had torn down trees, electric poles and wires in its path, throwing streets, homes and other buildings into total darkness. Miss Kellogg had her opening night without benefit of electric lights or of heat. 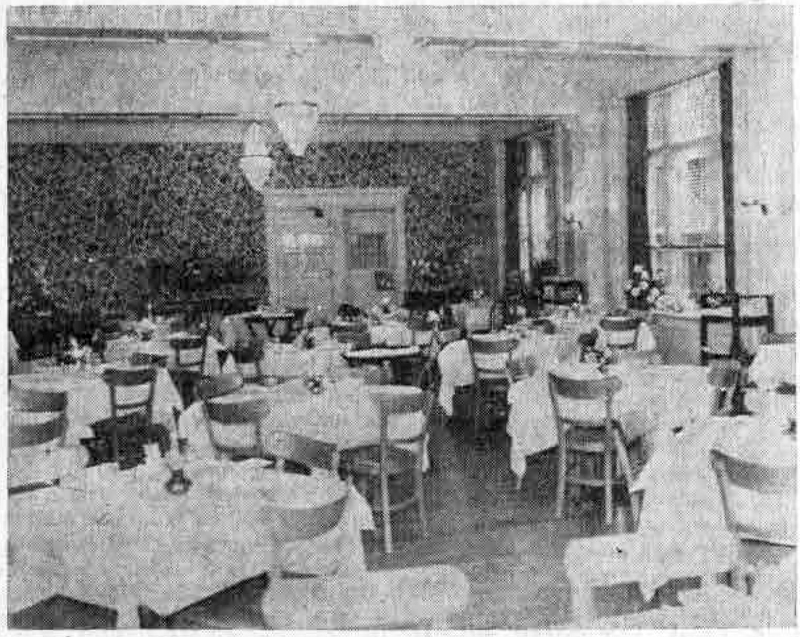 The same room as it appeared 50 years ago, as the dining room of the Waynewood Hotel, owned and operated by Charles Wood. In contrast to the darkness of the outside world, the softly lighted interior of the building was a delight. Many well-wishers among local merchants and townspeople sent flowers in such profusion that every wide window sill in the room, as well as all the tables and sideboards had their generous share. Each table had on it a small round glass vase filled with flowers, with a candle upright in the center of each, and tall candelabra on the sideboard shared in the illumination of the room. The candles turned back the years to the turn of the century when Charles Wood first bought the large tract of land, on which he later built the Waynewood Hotel. A musician and an organist by profession, Mr. Wood had been the manager of the old Louella Hotel in the era when many families left the heat of Philadelphia homes for the comparative coolness and comfort of Main Line hotels. After a few seasons of managing the Louella, Mr. Wood bought the large tract of ground directly adjacent to it on the west, and later built his hotel. Probably no one except its owner was more closely connected with the management of the new hotel than Miss Frances Hughes, now Mrs. Malcolm G. Sausser. With a business initiative uncommon in a young woman of that period she obtained a position that in present day parlance might be called that of a “hostess.” Her duties were many and varied, since Mr. Wood was more musician than hotel manager. She had entire charge of the office and the safe, answered all telephone calls and assigned rooms to guests. In addition, she directed the hotel’s personnel. “Old Jack” was then the chef and there was a large crew of waiters, with whom the young Miss Hughes had at one time to settle a strike. In addition to his ability as a musician, Mr. Wood possessed a really extraordinarily keen mechanical mind, according to Mrs. Sausser. She recalls with admiration, as well as amusement, some of the mechanical devices by which he took care of the large amount of washing necessary in a hotel. For instance, he utilized the heat from the machinery that ran the elevator to dry the hotel linens once they were washed! 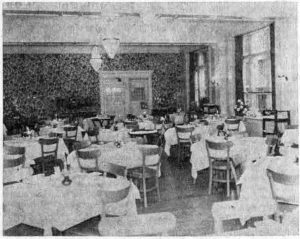 In addition to this picture of the old dining room, Mrs. Sausser has lent your columnist three other pictures, all of them of the grounds of the Waynewood Hotel as it looked in the early 1900’s. These will be used in next week’s column for which Mrs. Patterson would welcome other old pictures and further reminiscences of the hotel.